Focus on your core business, while we take over all maintenance tasks to guarantee the trouble-free use of your systems and to provide qualified support. Website maintenance: You aren’t just another anonymous customer number for us. Instead, you will receive professional and competent personal support. Use our support at critical junctures and agree customized maintenance contracts with us. You see that there are updates available for WordPress, themes and plugins? You want a secure system, competent professionals to talk to and regular maintenance of your web systems? 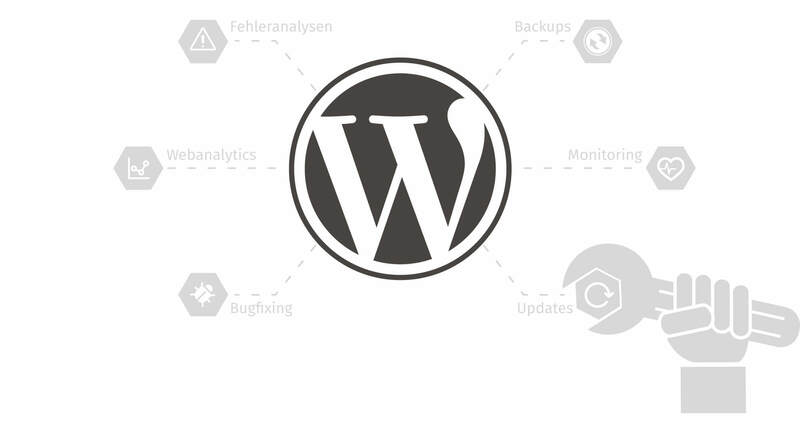 Imagine: You are logging in to the WordPress backend and see that new versions are available for a number of plugins, as well as a whole new WordPress update. You then install the WordPress update without any problems, install the plugin updates. And then the unthinkable happens: a function in one of the plugins was revised and now your whole website won’t function anymore as it used to. Worst case scenario: You didn’t make a backup before the update. With us as your reliable partner for website maintenance, this won’t happen anymore! You want customized maintenance or professional support? Your systems – just like your vehicle fleet – needs regular maintenance to continue functioning reliably and securely. Use your personal support channel via Slack to reach out to your assigned contact person. Concentrate on your day to day business and never worry about the seamless operation of your websites. It couldn’t be simpler: Periodic update loops and customized maintenance contracts will give you the peace of mind you need. Maintenance will be implemented as agreed initially on your test system. Only if everything comes off without a hitch it will be repeated for your live system. And of course, we inform about everything we do before executing. With us at your side you can be sure that update errors won’t remain undetected until your users submit complaints about the running of your website! That would look pretty unprofessional, and might cost you customers and therefore turnover. Professional and regular updates of WordPress, themes and plugins carried out by Inpsyde. Traffic analyses in order to identify issues and any performance bottlenecks. And let’s not forget: there will always be new requirements or technical innovations that you will want implemented. But you don’t want to worry about technical details – you need to look after your own daily business. You want competent people to talk to and you want sound advice. Contact Inpsyde today if you want competent, responsive support and quick solutions. For premium support and quick answers, you can use new communication tools like Slack. If you have any further questions – we’re always pleased to help. Just contact us.